The East Lake Woodlands Country Club were having severe problems with their lighting fixtures surrounding their tennis courts. The country club is well known for its superior tennis club and having an adequate outdoor lighting fixture system was imperative to aligning with their impeccable reputation. After the recent destruction caused by Hurricane Irma in the area, the country club was not immune to damage. The original lighting fixtures were blown down and damaged, so the tennis court repair project was a major priority. After our initial inspection it was agreed that a new installation of LED lighting fixtures was required. We removed the current lighting system and installed new concrete bases for our lighting structures. We erected steel poles with high wattage lighting fixtures, which would allow members of the country club to play tennis after dark. There were 8 employees of East-West Electric required for this job including two senior electrician technicians to oversee the project. The dates of the project were from 03/01/2018 to 03/08/2018. Minimal disruption to the schedule of the tennis courts was a high priority, with only one tennis court being cordoned off at a time. Member safety was a high priority for us, it can be hazardous to have electrical construction projects occurring in close proximity to the public, however at East-West Electric we pride ourselves in the care we took to look after the construction site. We worked on weekdays with the courts being repaired cordoned off, allowing members to continue with minimal disruption. For this project we had to use our full array of equipment in order to get the job done. We used an Auger Truck to drill into the ground in order to install the concrete foundations for the steel poles. 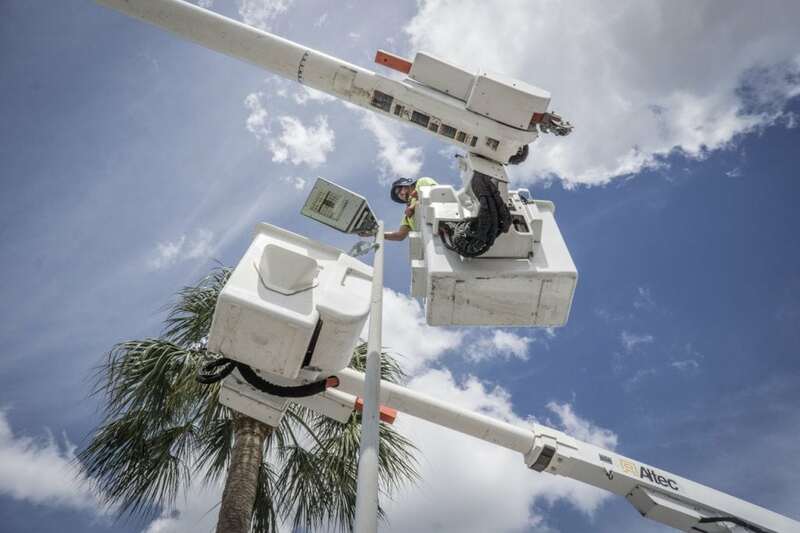 We used Bucket Trucks and Scissor Lifts to install the LED lighting fixtures on the steel poles. A Scaffold was set up around the perimeter of our work so as to further reinforce the safety of the tennis club members nearby. Forklifts were needed in order to bring the equipment and lighting fixtures to the construction site. East Lake Woodlands Country Club is situated in Oldsmar, FL. The country club has an aristocratic flair that is combined with a humble, caring, and professional staff with an eye for detail. The timeless elegance is experienced throughout the clubhouse. Facilities include a dedicated dining hall, pro shop, locker rooms, fitness center, banquet and meeting rooms, tennis courts, swimming pool, and a charming grill area. The country club also has two championship golf courses. If you’re in need of a highly experienced electrical contractor in Clearwater, FL give us a call on (727) 771-9403. You can also find our online contact form here. We will cater to all of your commercial electrical needs, from installing new lighting fixtures, conducting sports court lighting repair, and upgrading electrical systems. The damage caused by Hurricane Irma is still felt in the Pinellas County. We at East-West Electric are here to help.